In this challenge, you need to create a Program to Play Mancala, also known as Kalah. Note: these rules and diagram are based on Wikipedia's. The goal of the game is to capture more pieces, (or "seeds") than one's opponent. The player begins sowing from the highlighted house. The last seed falls in the store, so the player receives an extra move. The last seed falls in an empty house on the player's side, with seeds in the opposite house. The player captures the 4 seeds and ends his/her turn. At the beginning of the game, three pieces are placed in each cell. Each player controls the six cells and their pieces on his/her side of the board. His score is the number of pieces in the store to his right. If the last sown seed lands in the player's store, the player gets an additional move. There is no limit on the number of moves a player can make in his/her turn. When one player no longer has any seeds in any of his/her cells, the game ends. The other player moves all remaining seeds to his store, and the score for each player is the number of pieces in his store. 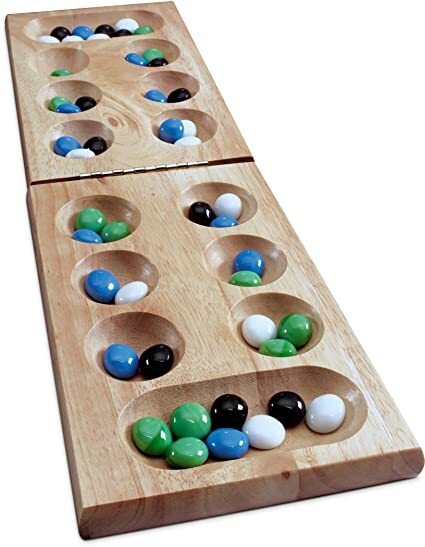 * This rule is for a variety of Mancala used in the current challenge. The goal of the game is to get the highest score by getting the most pieces in your store. The game consists of 2 rounds, so each player can go first. The winner is the the player with the highest combined score. This turn placed one piece in your own store, and 2 pieces on your opponent's side. Create a program to play mancala as described above. Good luck! Field twelve contains 12 pieces. --> The computer takes all of them and puts 2 into field 13 and then 1 in field 0, 1 in field 1 and 1 in field 2. Why does the computer put two pieces in field two? Sorry, field twelve does not contain 12, but 5 pieces.